The Facebook Messenger Revolution is here! 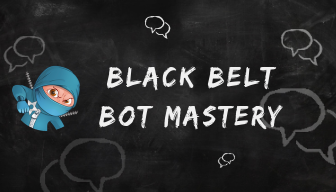 Black Belt Bot Mastery will teach you step by step how to create Bots for every part of your business, from attracting new fans to qualifying potential clients to getting feedback on your services. Chatbot In A Box is a collection of starter template chatbots, built especially for direct sellers. Engage your team members one on one, watch your team skyrocket! Click this to get three customer service templates. Put them on your website, your Facebook page, or wherever your customers ask you questions! Note: An account on ManyChat.com is required to be able to use these (I recommend the Pro plan). Templates in this box are easily adapted to for coaches of all of the following and more: Accountability, meditation, goal setting, self-care, healthy living, fitness, brand visibility, habit creation, and establishing boundaries.